Bangkok the vibrant capital of Thailand is considered one of the top tourist destinations in the world and hosts millions of visitors each year. A cosmopolitan, modern city that is full of contrast and also recognized as one of the friendliest cities in the world for the hospitality, grace and nature of the Thai people. Featuring some of the country`s most visited historical venues with awe inspiring architecture, gleaming temples and spectacular palaces. With its high rise skyline, luxury malls, extravagant hotels, street food stalls, massive markets, rooftop bars and restaurants, floating markets and risqué nightlife the city is filled with a variety of attractions for everyone. Wat Arun (The Temple of Dawn), The Grand Palace, Floating Market, Temple of the Reclining Buddha (Wat Pho), Temple of the Emerald Buddha, Temple of the Golden Buddha (Wat Traimit), Jim Thompson House, The Golden Mount (Wat Saket), Khao San Road, Chao Phraya River and so much more! Phuket is `the pearl of the Andaman Sea`, a breathtaking mountainous island in southern Thailand, with rain forests and numerous white sandy beaches featuring turquoise blue warm waters, limestone cliffs and caves. The islands spectacular scenery, simply stunning tropical sunsets combined with unbeatable outdoor activities, a rich and colorful history and a vibrant nightlife scene make this fun island a great place to extend your horizons. Phang Nga Bay, Old Phuket Town, Phi Phi Island, Big Buddha, Wat Chalong, Phuket FantaSea Show, Simon Cabaret Show and so much more! Chiang Mai Is the Rose of the North a unique and exotic city with a fascinating indigenous cultural history, the Old city is surrounded by the ruins of the old walls and a moat, nestled amongst the jungles and stupendous mountains which are home to the hill tribes. The region is filled with magnificent wildlife, spectacular scenery and exotic flora that can be observed in its National Parks. Wat Chedi Luang, Doi Suthep, Wat Phrathat, Wiang Kum Kam (Underground Ancient City), Chiang Mai Night Bazaar, Doi Inthananon National Pak, Karen Long Neck Tribes and so much more! The Phi Phi Islands are a magnificent set of islands rising from the Andaman Sea decorated by limestone cliffs with tropical jungle backdrops and deserted white sand beaches. Phi Phi is the ultimate destination for a relaxing tropical getaway boasting tropical beaches, gleaming emerald waters filled with colorful marine life and vibrant coral reefs providing some of the best snorkeling, diving and swimming in the world. Tonsai Village, Tonsai Tower, Monkey Beach, Viking Bay, Mosquito Island, Maya Bay, Bamboo Island, Loh Sama Bay, Phi Phi Viewpoint and so much more! The beautiful island of Koh Samui is one of the most majestic places in Thailand, lined with golden sandy beaches, engulfed in turquoise waters and a lush tropical jungle interior. This island is a piece of paradise with a laid-back island lifestyle. Visit the impressive temples at Wat Phra Yai and Wat Khunaram where the Giant Buddha and Mummified Monk are featured. Visit the magical un-touched islands of Angthong National Park and Koh Tao by boat, hike up to the breathtaking viewpoints, wander the many Night Street Walking Markets and dine on delicious Thai cuisine. Big Buddha, Ang Thong National Park, Koh Tao, Laem Yai, Wat Plai Laem, Hin Ta and Hin Yai, Tailing Ngam, Na Muang waterfalls, Bophu and so much more! Krabi is a coastal province and a popular beach destination set on Thailand`s southern coastline engulfed by the beautiful waters of the Andaman Sea. This charming port city provides a gateway into lush tropical rainforest interiors where natural hot springs, emerald pools, temples, and waterfalls can be uncovered. The city`s spectacular coastline is decorated with hundreds of tropical islands and signature limestone karsts where plenty of water-related activities can be enjoyed in the blue azure waters of the Andaman Sea. Whether you’re a looking for a relaxing day on a secluded beach, snorkeling or diving over the vibrant coral reefs, rock climbing in Railay, temple hopping or shopping the famous Krabi Walking Street Markets for that perfect souvenir, Krabi has it all. Krabi Hot Springs, Emerald Pools, Huay Toh Waterfall, Walking Street Market, Wat Tham Sua, Wat Kaew Temple, Fossil Shell Beach and so much more! Phuket is known as `the pearl of the Andaman Sea,` it is a mountainous, rain forested island with breathtaking white sand beaches, clear blue warm waters and stunning scenery. This gorgeous island features picturesque sunsets with a vibrant nightlife! 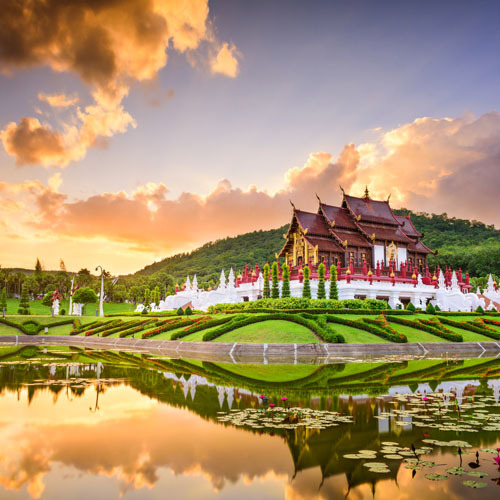 Rich in history and Thai culture the area features some of the most enchanting temples and spectacular shrines and offers an abundance of outdoor activities such as championship golf courses, world class diving and eco adventures in the tropical forests! Renowned for its natural beauty this fun island provides a mixture of relaxation along with high end restaurants and legendary nightlife. Explore Thailand's Beauty! Discover Bangkok, the capital of Thailand with its bustling mix of old and new; blending traditional culture and religion with all the luxury conveniences of a modern city. Continue the sensory experience with three nights in Phuket, Pearl of the South, with its endless beaches and crystal-clear blue. Our #1 Bestseller and Thailand first timer's favorite! Visit Bangkok, The Venice of the east, national treasure trove, with its Buddhist temples, palaces, floating markets, legendary nightlife and shopping. Then fly to Chiang Mai,The Rose of the North, famous for its history, culture and ancient temples; and complete your journey with some days in Phuket, Pearl of the South, with its endless beaches and crystal-clear blue ocean. This is a flexible package to Thailand vacation destinations with daily departures from anywhere in the USA or Canada. Choose your length of stay. Pick your own flights, hotels and activities. Add, remove or reorder cities. 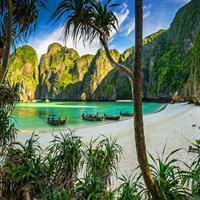 Explore the most extraordinary spots with this vacation escape to Thailand! First stop, Bangkok...the capital of Thailand with its bustling mix of old and new; blending traditional culture and religion with all the luxury conveniences of a modern city. Then, flight to Phuket, Pearl of the South, with its endless beaches and crystal-clear blue. After that, take the ferry to Phi Phi Island, one of the most spectacular beaches of the world! Recently rocking to fame with the filming of the movie 'The Beach'. There are no roads on the island, so be prepared for a walk when you get there! Lastly, go back to Bangkok to relax before going back home. This is a flexible vacation package to Thailand with daily departures from anywhere in the USA or Canada. Choose your length of stay. Pick your own flights, hotels and activities. Add, remove or reorder cities. Discover the amazing culture of Thailand! Floating markets, golden temples, colors and flavors is what you will find in Bangkok, the capital and most populous city of Thailand, where you can marvel at the gleaming buildings, catch a tuk tuk along the bustling Chinatown or take a longtail boat... it surely sounds like something out of an exotic fairy tail. Then fly to Chiang Rai and hit town to enjoy all the free cultural performances, take a glimpse of the local products and souvenirs or taste their delicious street food. Up next is the laid back Chiang Mai, nestled into the foothills of northern Thailand where the landscape is picturesque and out of a postcard with many cultural and outdoor activities. Lastly is Phuket, with its tropical weather and dreamy beaches it is certainly a place that will make you feel like staying there forever. 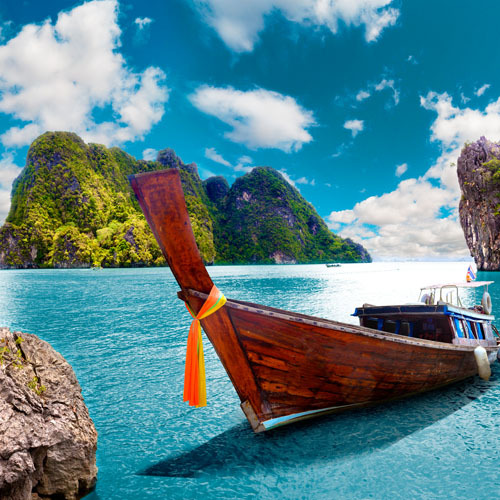 Experience the best of Thailand; Exciting Bangkok and idyllic beaches of Phuket and Koh Samui, two of the most beautiful tropical islands decorated with clear waters, white and golden sands, palms and coconuts - which make it truly a paradise on the earth. The ultimate city and beach combo! Visit Singapore, known as the Lion City, one of the world's finest travel destinations; A city that may be small in size, but more than compensated for that in friendliness, hospitality, natural beauty and culinary excellence. Then fly to Phuket, Thailand's largest island and a tropical paradise with white beaches, crystal clear water and swaying palm trees; a diverse and fascinating island to explore. Unrivalled Combination. Start this splendid trip flying into Singapore, a dynamic mix of cultures and histories, exciting nightlife and a wide range of tourist attractions such as the National Gallery of Singapore, the Orchard Road shopping area and Marina Bay Sands. Up Next go to Siem Reap, an unforgettable place, where you will find breathtaking attractions such as Angkor Wat, Bayon Temple and Ta Prohm. Finish this marvelous experience in Phuket, with endless sandy beaches, blue waters and great food. Visit Phang Nga Bay, sightsee old Phuket Town or enjoy Bangla Road nightlife, there is always something to see and do. Discover Hong Kong, Bangkok and Phuket Highlights! Explore Hong Kong, the place where East meets West! Western culture coexists seamlessly with traditional philosophy and practices of the Orient offering unique experiences to Hong Kong's tourists. Visit one of the biggest attractions, Hong Kong Disneyland or the world's tallest, bronze Buddha, you can move on to the Lantau Peak, and admire the view of the surrounding city skyline, the world-famous Victoria Harbor and Kowloon, towering skyscrapers and peaceful green hillsides! Then fly into Bangkok, land in the colorful, exotic and pleasingly city! While here, visit the impressive sacred temples and get amazed by the authentic experience of the pioneer floating markets. Last but not least, fly to Phuket, a marvelous city where you can extend your horizons! Practice some water sports in the beautiful beaches they have to offer. Exotic cities and beaches! 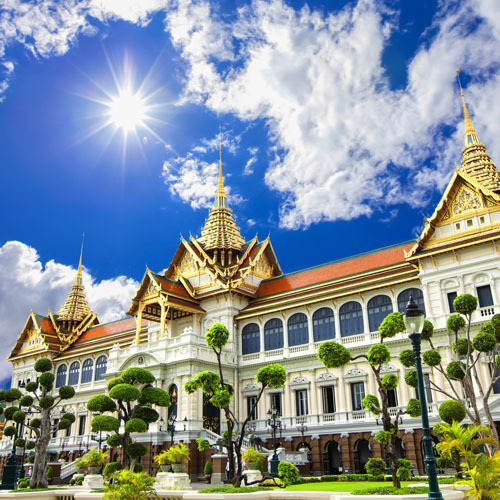 Explore one of the world's top tourist destinations; Bangkok, with its multi-faceted sights and attractions like Royal palaces and temples as well as several museums. 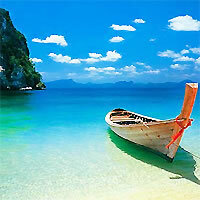 Then fly to Phuket and delve into its spectacular scenery, stunning tropical sunsets and warm blue sea. Last but not least is Krabi, a town that is majestically situated among impossibly angular limestone karsts that offer beautiful white sand beaches and turquoise sea. Just you and paradise!!! Temples, World Heritage Site and Beaches! Start your trip in the marvelous city of Hanoi, which is considered one of the main cultural centers of Vietnam and begging your vacation visiting their renown Ho Chi Minh's Mausoleum, without a doubt the city's single most visited site, and one of Vietnam's most revered places. Then fly to Siem Reap and explore 'Angkor Wat', the central feature of the Angkor UNESCO World Heritage Site containing the magnificent remains of the Khmer civilization. Last but not least fly to the fabulous island of Phuket, the biggest island in Thailand, certainly the perfect destination for beachaholics that are looking forward to have fun in the sun! Memorable beach and culture combination holiday! Begin this incredible experience flying into Phuket, "The Pearl of the South", with its endless beaches and magnificent tropical sunsets. Sightsee Phan Nga Bay with its amazing lagoons and then go to old Phuket Town featuring fantastic shop houses and mansions. You cannot leave Phuket without a visit to the Big Buddha, located on the top of a mountain from where you will enjoy impressive views. Up next fly into Bangkok the capital andmost populous city of Thailand, where you can marvel at the gleaming buildings, catch a tuk tuk along the bustling Chinatown or take a long tail boat... it surely sounds like something out of an exotic fairy tail. Then fly to Delhi, discover their enchanting attractions visiting magnificent structures such as Chandni Chowk Market, one of the oldest and busiest markets; Humayuns Tombs, first example of Mughal architecture and tomb of Mughal Emperor Humayun; Lotus, one of the most visited buildings in the world; India Gate, is a war memorial and first gate constructed; Qutub Minar, second tallest minar in India and UNESCO World Heritage Site. Last but not least, fly to the marvelous city of Goa, the land of beaches and one of the most relaxing places in India. Visit really interesting places such as Ancestral Goa Temple and St. Francis Church. Some of the best white sand beaches are Anjuna, Calangute and Colva, amuse yourself and relax while sun goes down. Goa is also known for its temples and world heritage architecture including the Basilica of Bom Jesus in Old Goa. This is a truly unique experience you won't want to miss. We travel with trip masters always and we have loved each trip.